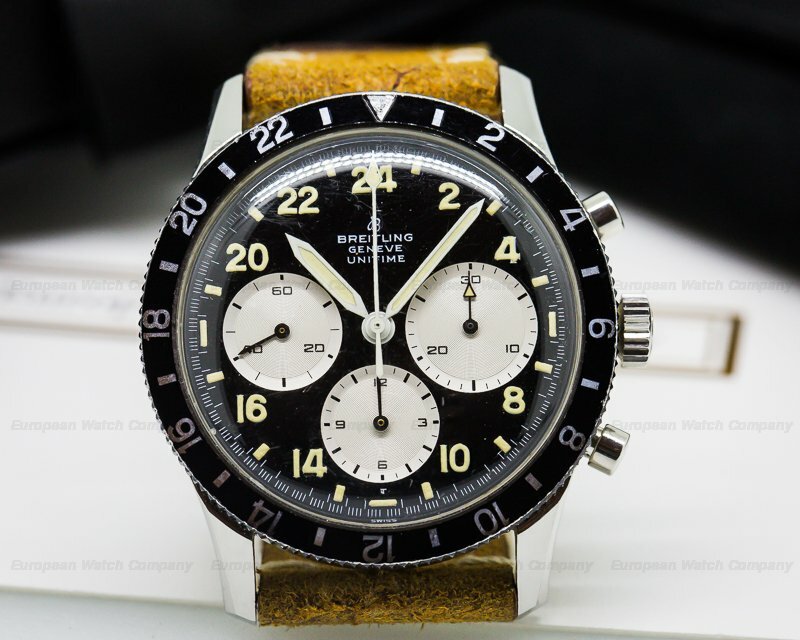 TimeZone : Breitling » Two 1765s -- legit? Greetings friends, and thank you to Fred and Chick for having me. I came across these two 1765s for sale this morning, and wondered what you thought. Both have two details I haven't seen before: an arrow hand (not a stick) on the minutes subdial, and a bezel whose 12:00 indicator doesn't have the lume indent. I'd otherwise assume that these were thoughtless mods made during a repair, but that both watches are consistent with each other makes me wonder. Any thoughts? So hard to tell but looks great, any pics of the movement? I assume you had expected them to look like this: ? 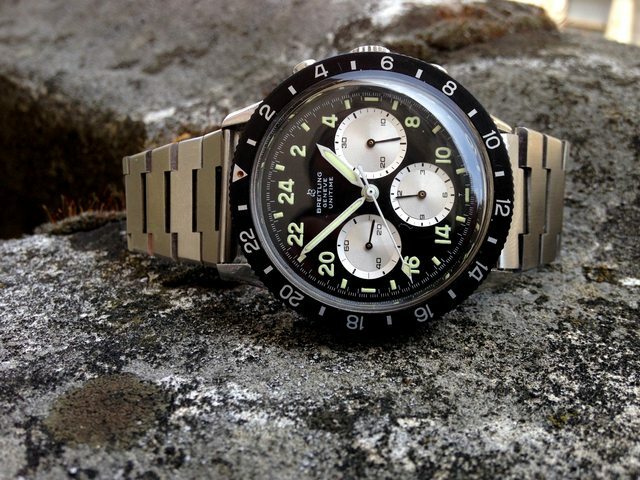 but there are earlier versions - none of the collectors seemingly aware of them until I found a NOS service bezel for one of my Unitime 1765s, just to discover it was too small to fit my watch that required a 42.8mm bezel. turn out there was a Unitime variation based on the smaller 41mm bezel cases of the ref. 765CP - and even stranger, these are the only known (authentic) Breitling not to be stamped with serial numbers, so impossible to date precisely. so legit, rare, a bit strange. note that one of the watches offered on that site seems to have an (excellent) dial relume. Fred, thank you so much for taking the time to reply! I'd read your bezel story before, but forgotten that it concerned a 1765. Thanks also for pointing out the relume -- I don't know that I can tell which one has been retouched. What's the sign to look for? It probably fell out. The subdial hand I would guess was fitted by a third party watchmaker as a repair at some point using another Breitling watch or other spares lying around, as they often do when they can't get a part or it's cheaper and the customer isn't bothered.